NetEnt is one of the highly-ranked Nordic stocks and the top-ranked gaming stocks in my investable universe. The stock price fell to the 2014 level, while its most fundamentals remain decent. The stock is currently traded at a 10-year-low level in terms of price multiples, offering an attractive entry point in light of both risk and reward. NetEnt (OTCPK:NTNTY) is currently one of the highly-ranked Nordic stocks (only after Novo Nordisk (NVO)) and the top-ranked gaming stocks (Evolution Gaming (OTCPK:EVVTY) being the closest follower) according to my factor-based stock quality model. 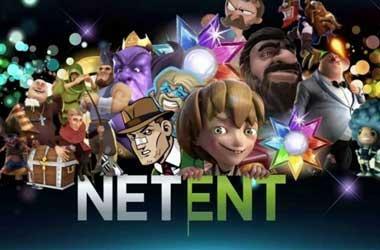 NetEnt AB (publ) is a leading digital entertainment company, providing premium gaming solutions to the world's most successful online casino operators. The Sweden-based company offers around 200 game titles in 24 languages as well as a powerful technology platform with a server solution and 24/7 support 365 days a year. Running on a partnership model, NetEnt is responsible for operation and monitoring of gaming transactions through hosting and gaming operators pay royalties to the company based on a percentage of the game win (i.e., player bets minus player wins) generated. The share is primarily traded on the Stockholm Stock Exchange (NET-B). The US investors can get access to the stock through its ADR (NTNTY) on OTC, while, of course, the liquidity there is a drawback. Euro-based investors can choose to trade the ticker KT0T on Xetra. At the time of writing, the total market capitalization of NetEnt is around 7.5 billion SEK, which equals roughly to 810 million USD. 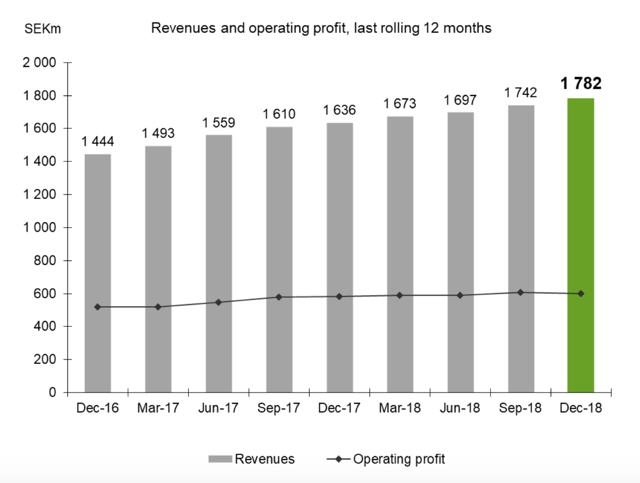 Overall, NetEnt is a small-cap tech-driven company focused on a fast-growing niche market globally with a revenue-sharing B2B business model, which offers reliable income streams from predictable, small-ticket, repeatable transactions (see some business metrics below). Source: Investor Presentation, November 2018. With the popularity of online casinos on the rise, it comes as no surprise that game providers, such as NetEnt, have seen some decent returns for their owners. Source: Google Finance; data as of 4/7/2019; performances excluding dividends. From mid-2009 through mid-2016, the share price of NetEnt went up almost 10-fold while the stock paid annual dividends, wildly beating the benchmark (i.e., NASDAQ OMX Small-Cap Sweden Index). However, since then, the stock has plunged more than 65%, mainly because of the management change and slowing growths resulting from market saturation and re-regulation, significantly trailing the underlying index. On Friday 4/5/2019, the stock was down almost 12% in one day, trading at 30.88 SEK as of market close. This is the level not seen since 2014. In the meantime, both top and bottom lines have more than doubled since then (see below). Source: Morningstar; data as of 4/7/2019. So, were investors previously so over-excited or are they nowadays being too fearful? Or maybe both? Let's go through the evaluations of NetEnt's business fundamentals, valuations, and risks next. As indicated previously, NetEnt is one of the top 13 stocks that my factor-based model picked for 2019 in terms of business quality. The model mainly looks in capital efficiency/intensity, financial health, cash generation, profitability, shareholder-friendliness, growth/momentum, moat, management, and the industry of a specific company. 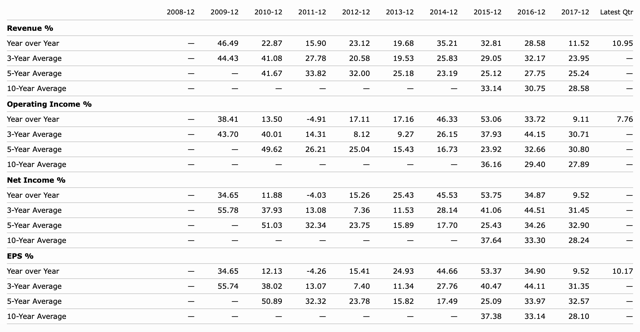 NetEnt has consistently delivered superior returns on capital for its shareholders (see below): e.g., ROIC seldom dropped below 50%, ROA seldom below 30% during any year over the past decade. For the past couple of years, the net margin was stable while the asset turnover improved (from 1.27 in 2016 to 1.46 TTM). The business is also quite consistent in terms of generating cash. 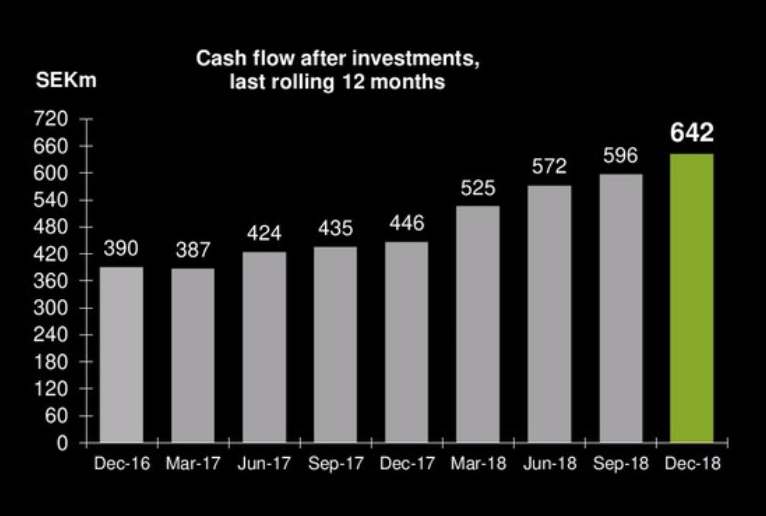 Although the CapEx is a bit high as a percentage of the sales, the free cash flow margin has been maintained at above 15% every year except for 2010 over the past decade. All the above was achieved with no debt and a healthy balance sheet (i.e., the current ratio has been always greater than 1.2x). Back in 2014/2015, NetEnt was growing so explosively with, as you can see below, around 50% YoY increases in net income and operating income. Fast forward to today, NetEnt does not appear to be a smoking hot stock. The growth rate has declined to single digits, primarily due to the saturation of some major markets and pull-back from some other markets being re-regulated (e.g., Australia). The stock market always tries to be forward-looking so that the share price of NetEnt started to reflect the decline in growth years earlier. 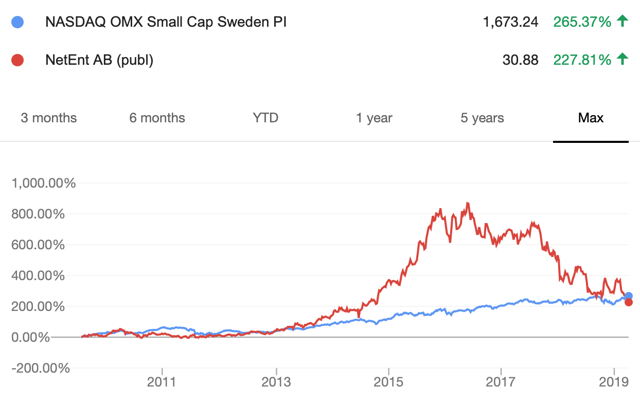 Following the de-accelerated business development was the management change in 2018, with the then CEO Per Eriksson leaving the firm and being replaced by the then CFO Therese Hillman, which created uncertainties and concerns for investors. 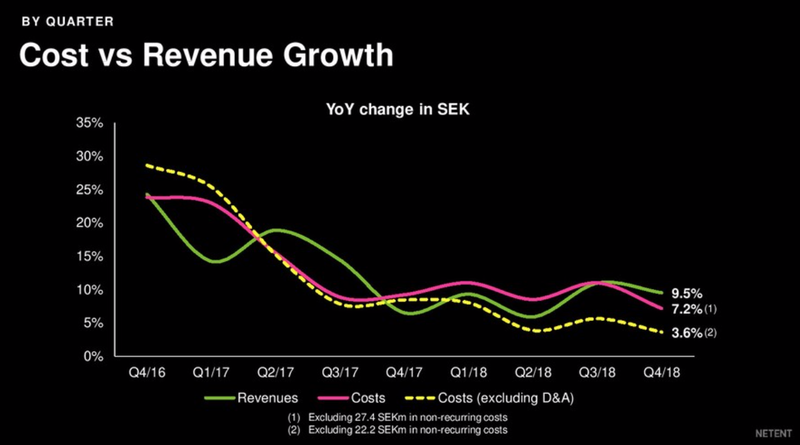 More recently, exacerbating the stock movement may be the new Swedish gaming regulatory regime, which is adding an 18% gaming tax in 2019 that NetEnt has warned will affect revenues negatively. Having said all these, we are looking at the NetEnt business that is still growing and comfortably profitable. 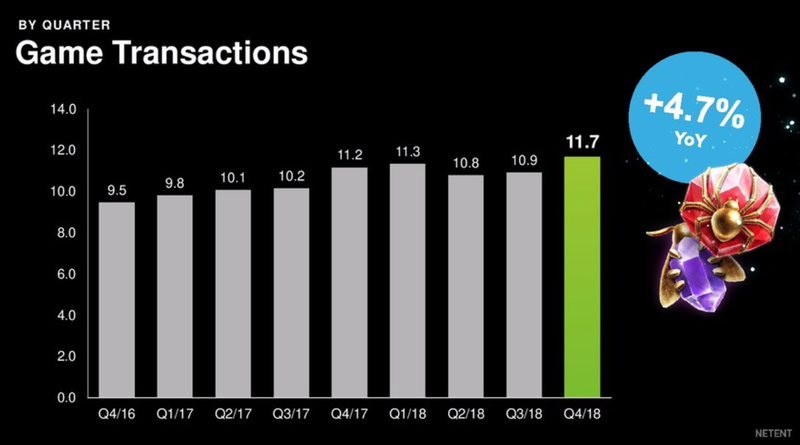 As of Q4 2018, the company just booked its record-high revenue, driven by record-high game transactions (a 4.7% increase YoY, which is not so wonderful but not too bad, either). Source: 2018 Q4 Earnings Presentation. Source: 2018 Q4 Earnings Report. 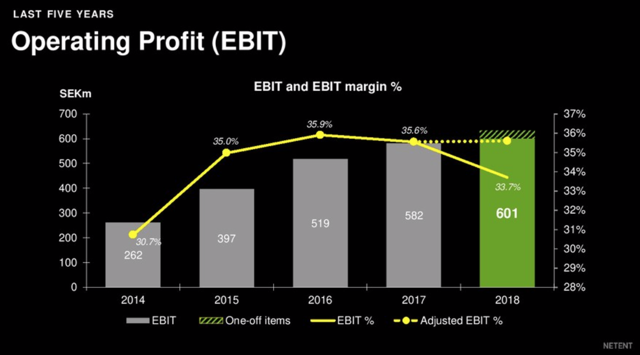 The EBIT margin remains superior with some improvements for the past few years, thanks to the decrease cost growth in response to the lower revenue growth (see below). With the disciplined CapEx, NetEnt also delivered a record-high free cash flow to its shareholders for the past quarter. In terms of returning capital, NetEnt has been paying dividends since 2005 and has never cut them. The current payout ratio is 90%, which may seem a bit in the danger zone, but, with a free cash flow conversion of 1.23x, investors should feel assured for the sustainability of this dividend level at least for the short run. Source: Simply Wall St; data as of 4/7/2019. NetEnt is still in good shape fundamentally, while we have to admit that the name is just not as exciting as it used to be. When growth momentum starts to lose its stream, a new way forward needs to be paved - this is just the situation confronting almost all public companies at some stage (think about Facebook (FB) recently and Microsoft (MSFT) previously). 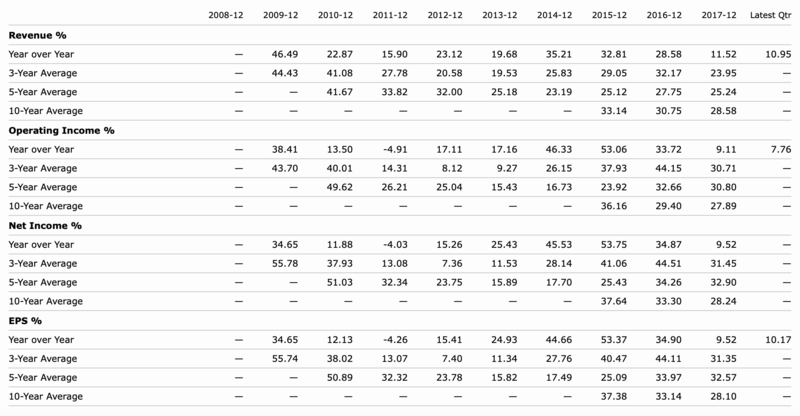 In light of data availability, I am using the Germany-listed ticker KT0T with Morningstar to discuss the valuations. As we can see, the current price multiples of NetEnt are well below their 5-year averages (e.g., P/E of 12.3x vs. 37.2x, P/CF of 7.9x vs. 26x), implying a possibly significant discount of the current price to its fair value. 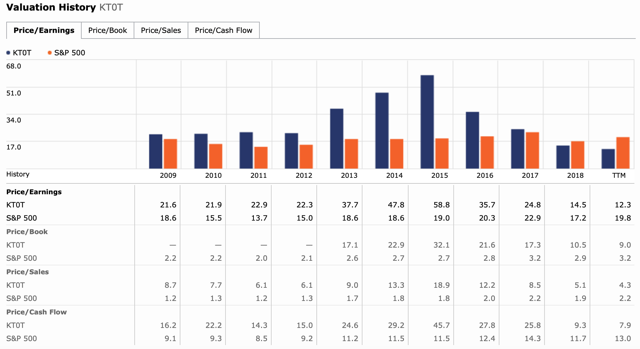 Actually, per the chart below, we notice that the NetEnt stock is traded at the lowest level in terms of P/E, P/B, P/S, and P/CF for the past decade. Currently, the company plans to grow both vertically (with more games to release) as well as horizontally (through international expansion). 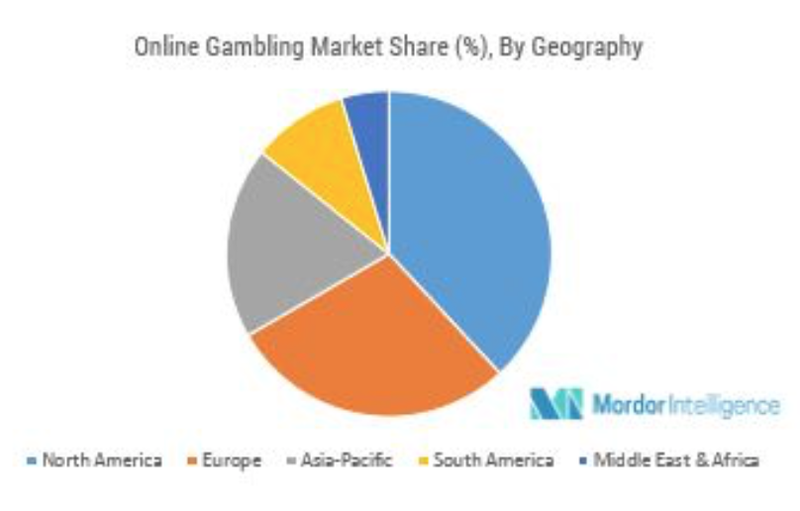 The global online gambling market is forecasted to register a CAGR of 9.7% from 2018 through 2023. According to the company itself, NetEnt has an estimated global market share of 17 percent, and 28 percent in Europe, and landed casino still dominate the gambling space (95% landed vs. only 5% online). The company should have plenty of rooms to grow with the market as well as alongside the market. According to Simply Wall St (see below), the earnings at NetEnt is expected to grow at 7% annually, which appears quite conservative compared with the figures above. However, even with a 7% long-term growth rate, we end up with a PEG of 1.76x, which is not bad at all for a high-ROIC, debt-free and still-growing company like NetEnt. If we can assume a lifted but still unexaggerated growth rate of 12%, considering the industry tailwind, market share gains, and track records of previous growth, then we would have a PEG close to 1.0x already at the present level. As we conclude about the cheapness of the stock, the question now becomes: is the value here worth the risk? Or, is there far more than enough reward to cover the risk? The current CEO, Therese Hillman, was formally appointed last May, followed by the onboarding of the new CFO, Lars Johansson. Most of the organizational restructuring should have already implemented and been already priced into the stock. Ms. Therese Hillman has been with the company since January 2017 and held multiple C-level roles on the general management, finance and operations sides with other businesses previously. One fact worth mentioning is that many of the current executive team, including Therese Hillman, have been buying shares since the management change and they were even paying 20% more than what Mr. Market can offer you at the moment (in terms of last Friday's close price). Just as with tobaccos, I believe that the ongoing re-regulation is a double-edged sword in terms of risk/reward - on the one hand, regulation, in general, would increase operating costs and pose threats to revenue growth; on the other hand, it would lift the barrier of entry and reduce competitions, providing already-established players with better competitive positions. In the past, NetEnt's revenues have not been negatively affected by a weaker economy (e.g., 08/09 financial crisis). However, the online casino industry is affected to a certain degree by the general state of the economy. 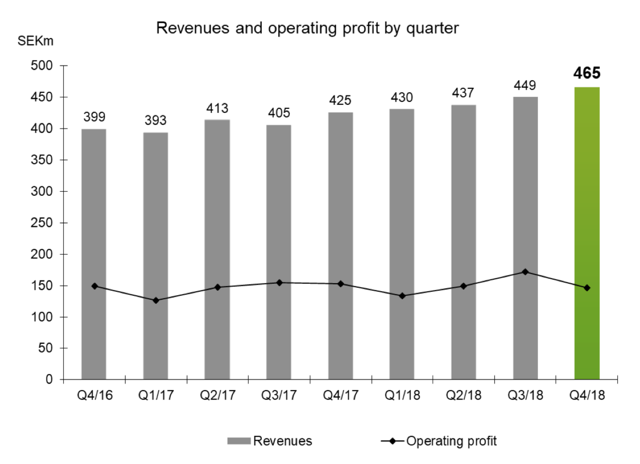 A recession can lead to a reduction in the disposable income of consumers and consequently in demand for digital entertainment, including online casino games. I believe that NetEnt's widely-distributed products would reduce the company's exposure to this cyclical risk in the hope that the regional markets served do not follow the same business cycle. On the contrary, with more stable growth and secure dividend payouts moving forward, the stock may be a good candidate of safe-haven bet in the stock market for income seekers. As discussed above, slowing growth was the major factor behind the poor stock performance for the past couple of years. Since then, the management has been focused on building the new growth engine, by opening up new markets, such as some states in the US, cutting cost (or shifting more resources towards production) as well as increasing game release volume from 20ish to over 30 per year. 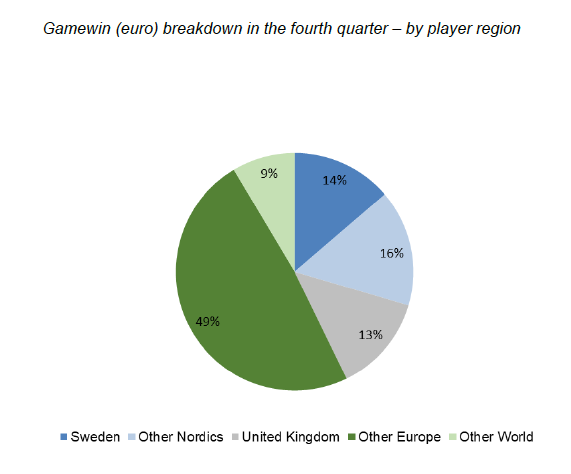 As of Q4 2018, only 13% of the game win is generated outside of the European region, while North American presents a massive and lucrative region among the total global online gambling market. This disconnect offers plenty of opportunities for NetEnt to grow geographically. With the developments unfolding in the US online gambling scene, NetEnt felt that timing is right to intensify its efforts to enter both the United States and Canada in as early as 2014. Since its first game launched in New Jersey in 2015, the company's expansion has never been stopped, signing up local gaming operators and covering more regions, such as British Columbia and Pennsylvania recently. The share price of NetEnt fell to the 2014 level, while its most fundamentals remain decent. The stock is currently traded at a 10-year-low level in terms of price multiples, offering an attractive entry point in light of the risk taken vs. the potential reward in my view. Taking a position in NetEnt now is a bet that nothing will get far worse from this point on, which is not of certainty but highly unlikely per the analysis above. 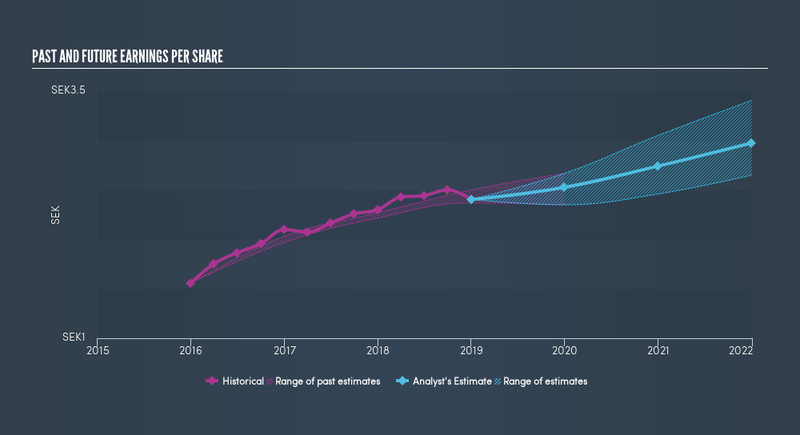 I would like to give NetEnt a buy rating at this price level for long-term buy-and-hold investors. Lastly, just a reminder that the annual report for 2018 will be published online on 4/17/2019. Disclosure: I am/we are long NTNTY. I wrote this article myself, and it expresses my own opinions. I am not receiving compensation for it (other than from Seeking Alpha). I have no business relationship with any company whose stock is mentioned in this article.